6/11/18- 2018 Holidazzle Futurity Stallion & Breeder Stakes information available! ​4/11/18 - Please Welcome the 2018 NCRCHA Board of Directors: Jim Wilson (President), Jason Saffert (Vice President), Deb Matko (Secretary), Lance Scheffel (Treasurer), Monty Bruce, Zach Hedberg, Mike Hansen, Kim Deters, Ryan Gallentine and Ashley Lembke. ​1/9/18 - The NCRCHA Class Definitions for 2018 are in the middle of being updated. Note, the prior NCRCHA club show classes that align with the NRCHA National classes are being removed and the EOY awards will be based on your National Class entries. The only exception is the 1K boxing class - that one will remain a separate club show class - because it is also a points addition for the Rookies. The rest of the National equivalent classes you will now be required to have a current NRCHA Membership to participate in addition to the NCRCHA club membership. There are other changes as well - check out the Home...->Class Definitions page. 1/9/2018 - The 2018 show schedule has been updated on the 2018 Show Schedule page. More info to come! Also remember to follow NCRCHA on Facebook! ​1/9/18 - Jim Simon has again agreed to sponsor the Ranch Riding Circuit Saddle for the 2018 season. The qualifying shows will be from January 1st through September 1st. (means the race starts in March). The 2 June shows will allow for "points catch up" as those 2 shows will have double points counted toward the Ranch Riding Saddle. See the flyer on the show schedule page and the class definitions for more details. ​1/9/18 - Also noteworthy - the July show will be 4 priority AQHA shows with a larger offering of classes. They will be held as 2 sets of split combined AQHA shows in addition to the normal NRCHA/NCRCHA class offerings. There will also be an AQHA Ranch Versatility show offered. This will be a 4 day show so plan ahead! 6/1/17 - June Showbill, schedule and registration form is on the 2017 schedule page. 5/4/17 - April Results are posted on the results page. ​5/4/17 - May Showbill had a couple of errors corrected and the Pre-Registration form is available. 5/2/17 - May Showbill is posted. Registration form will be there by 5/4. ​12/09/16 - December Holidazzle Futurity Results Posted! Visit the Show Info -> results page for details. All, the EOY Banquet will be held on Saturday evening following the horse show in the lobby at Simons Arena. It will be a pasta dinner this year with coffee/water. BYOB for any stronger beverages. The cost is $10/person. Youth 10 and over are $5/youth. 9 and under are free. End of year awards for 2016 will be presented at the banquet. 11/21/16 - The PreRegistration form is posted for the High School Rodeo participants. The PreRegistration for the rest of the participants is also available on the Winter Series Page. Watch the website for further updates. 8/18/2015: August Results and EOY Results are posted on the results page. 7/27/2015: July Show Results posted on results page. 4/27/2015: April Show Results posted on results page. 4/8/2015: Posted a preliminary August Showbill. 4/1/2015: Posted on the schedule page: April Showbill (Minor Corrections), April show Registration, May, June and July show bills. 3/10/2015: Updated Board of Directors with the Election Results. Congratulations to all Electees. 1﻿/﻿15﻿/2015: Updated 2015 Class Definitions. 1/13/2015: Upda﻿ted ﻿2015 show schedule is available on the schedule page in addition to the April showbill and clinic information. 8/18/2014: August Show Results and Final End of Year Circuit Points posted on the Results page. 7/21/2014: July Sunday Horse Show and Club Show results are posted on the results page - along with the 2014 circuit points. 6/25/2014: AQHA Cutting has been added to the August 16th show. Check the show schedule page for more details and the pre-registration requirements. The results have been posted from this weekend's Fall Futurity/Derby and Horse shows. Check out the results page for the information. Thanks again to all of the participants and volunteers! It was a fun show weekend. The show bill is posted for the 2013 Fall Futurity/Derby in Cannon Falls November 1-3, 2013. Go to the Show Schedule page to download it. The Online Registration form is available both on the home page and under the show schedule page. Also - New this year, there will be a Short Stirrup "Spook Fest" Reining class offered on Saturday (11/2) after the Futurity/Derby Herd work. 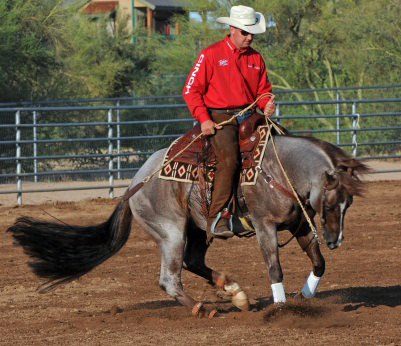 Bring your young kids; they can do the simple short stirrup reining pattern (lead line, walk, trot or lope - wherever they are comfortable). And, at this special event, they can do it in costume since it is Halloween Weekend! All the kids entered will get a prize and a ribbon! Entry fee is $5. The show results for the NCRCHA August Show (Aug 17-18) is posted on the results page, along with the final 2013 End of Year Circuit points. The August Showbill is posted. Check out the new addition of the Bridle Spectacular classes for Open and Non-Pro (including the boxing class). There has been additional added money for the Bridle Spectacular. Both the Online Registration form and the Printable form that you can either email or fax is also ready on the website. Visit the Show Results page for the July 2 day show results and payouts. The show was another success and the addition of the Short Stirrup Reining class added some special entertainment to the show. Photos coming soon. Also, those of you that participated this weekend, you are still able to order photos from the photographer, Nancy Loudon who took photos. She took photos of most of the participants on Saturday, but Sunday she focused on those individuals who ordered a DVD. You will receive a DVD with all the photos of your runs for $50, plus a printed 5x7 of your choice. Click here to email Nancy with inquiries: Nancy Loudon Nancy has agreed to come to the August show also - in case you missed her in July. The results for the Working Western Celebration held this past week at Simons Arena in Cannon Falls is posted on the results page. Due to a scheduling conflict with the Simons arena, the Fall Futurity Derby date has had to change to the first weekend in November. The herd work will begin on the afternoon of October 31, and the show will run from November 1-3. The location is still Simons Arena. The board has had to make the tough decision to change the date of the show in July. The South Dakota Independence Derby has moved from the holiday (Independence) weekend to July 13-14. 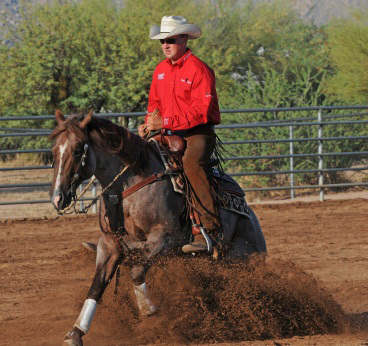 Many of the participants for our July show also attend the Independence Derby, as a result, the entries would be extremely low at the NCRCHA event. Therefore, the July 2 day show will now be held on July 27-28. The NCRCHA is happy to announce a new class addition to the NCRCHA show this weekend, May 24/25/26 in North Branch. The "Short Stirrups" class will be offered Saturday evening. This class is for the youth rider not yet comfortable showing in the youth class. It is designed to give the beginner youth rider an opportunity to show their horse or pony in a very relaxed atmosphere and to foster enthusiasm for the horse and the sport. Visit the "Class Definitions" page for details. The NCRCHA board of directors has made a change in the end of year awards for the club show classes. Starting in 2013, the $5000 Limited class will now receive a jacket instead of a saddle for the first place winner. The saddle will be awarded to the first place of the Non Pro Limited Boxing class. The remaining awards for 2nd and 3rd will remain the same. The class definitions have been updated to reflect this change. Go to the Schedule page to pre-register for the July Club show. The herd work classes are limited to the first 20 registrations. Maximum of 3 entries per rider until 30 minutes prior to the class then additional horses may be entered up to the maximum of 20. The results from the sanctioned June Club show have been posted on the results page. And Congratulations to Kaid Bruce for earning his rookie buckle at the show. The Spring Derby Show Bill results have been posted on the Show Results page along with the club circuit points totals. Congratulations to the 4 rookies who earned their buckles during the Spring Derby: Jason Saffert, Emily Saffert, Addison Fjelstad, and Deb Matko. The pre-registration for the upcoming shows has been updated on the show schedule page. There is now a pre-registration per event which includes picking the classes you plan to enter. The registrations are specific to the event and the offered classes. You will still checkin and pay at the event - and confirm your pre-registered classes. You will also need to show a copy of your horse registration papers. You may also update your pre-registered classes if need be at that time. Go to the schedule page and find the event; there you will find the pre-registration printable form or you can choose to use the online registration - one registration per horse. Visit our Newsletter page to read the 2012 newsletter. NCRCHA Class Definitions Updated for 2012! Check out the updates on the Class Definitions Page. Many thanks to Bill Enk for a great clinic. Almost 40 participants attended! It was entertaining and educational for judges and participants alike. 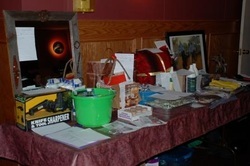 Congratulations to all of the silent auction winners!! !